Cultures of memory are organized by round numbers, intervals of ten; but somehow the remembrance of the dead is easier when the numbers are not round, when the final digit is not a zero… [I]t is perhaps easier to think of 780,863 different people at Treblinka: where the three at the end might be Tamara and Itta Willenberg, whose clothes clung together after they were gassed, and Ruth Dorfman, who was able to cry with the man who cut her hair before she entered the gas chamber… Each of the 21,892 Polish prisoners of war shot by the NKVD in 1940 was in the midst of life. The two at the end might be Dobiesław Jakubowicz, the father who dreamed about his daughter, and Adam Solski, the husband who wrote of his wedding ring on the day that the bullet entered his brain. The Nazi and Soviet regimes turned people into numbers, some of which we can only estimate, some of which we can reconstruct with fair precision. It is for us as scholars to seek these numbers and to put them into perspective. It is for us as humanists to turn the numbers back into people. If we cannot do that, then Hitler and Stalin have shaped not only our world, but our humanity. This passage—it comes at the conclusion of Bloodlands— is worth bearing in mind, for it helps to restrain the cynical temptations of the sentiment (apocryphally attributed to Stalin) that while the death of one person might be a tragedy, the deaths of millions is a mere statistic. Ironically, that sentiment sometimes seems to have had greater sway among some of those concerned about Tibet’s modern fate than one might think, perhaps because the figure that the Tibetan political leadership adopted in the 1980s, 1.2 million Tibetan deaths over two to three decades (rounded down from a rougher, albeit little mentioned number), is the figure that is almost always cited. It is an anesthetizing number and it stands in spite of the fact that it was reached on the basis of the most unreliable and anecdotal methodology. Indeed it has been hard for any but the most uninformed partisans of the Tibetan cause to grant any credence to the number; more objective observers (including many who are unabashedly sympathetic to Tibet) have rejected it. The 1.2 million figure was largely derived from estimates made as a result of the first visits of Tibetan delegations from Dharamsala to Tibet beginning in 1979, particularly the first delegation, as well as interviews with Tibetans coming into exile. No one involved in the delegation visits had any demographic training, but more to the point, given the difficulties inherent in counting living people in a country to which one has full access, the impossibility of accurately counting—with or without the requisite training—the deceased over a period of several decades in a country to which one has highly limited access should have been obvious to all. I mention this not to downplay the extent of the slaughter in Tibet (and let’s not mince words about what happened) but simply to posit that one cannot simply assign a figure without any serious attempt to establish a basis for it. To do so is to bring oneself to the point at which a million deaths do congeal into a mere statistic. Should the 1.2 million figure then be dismissed? Yes; not because something horrible did not transpire on the Tibetan Plateau, but because it has no reliable foundation. It is beyond dispute that there have been massive deaths in Tibet in the period between approximately 1950 and 1975. But 1.2 million? It is currently impossible to say. And by that I mean that while the actual number of deaths might be much less, it would still have to be very considerable. One simply cannot know the exact number without free access to Chinese records. But the fact that a large-scale slaughter took place ought to be unquestioned. The matter of mass death in Tibet has rarely been raised within the PRC, at least officially, and then, only to rebut claims of such an occurrence. And for a number of years one has seen scant reference to it in official exile statements, perhaps partly a result of the United Front Work Department injunction several years ago (passed on, as we now know, directly to Lodi Gyari and ultimately enunciated by the Dalai Lama) that Tibetans must do nothing to embarrass the Chinese Government. (The degree of obsequiousness inherent in this is indeed revelatory.) But the traces of history don’t always comply with the wishes of the political class. In May, just a few months ago, preparations were made for the start of a building project in Nang-chen county in the modern Yushu Tibetan Autonomous Prefecture in Qinghai Province, part of what was once the old kingdom of Nang-chen in Upper Khams. This is also the site of some of the instances of self-immolation, the act of protest that has been repeated again and again across Tibet and in exile over the last several years. As the ground was turned to start the construction of a house, something horrid—unexpected and uninvited—suddenly materialized. 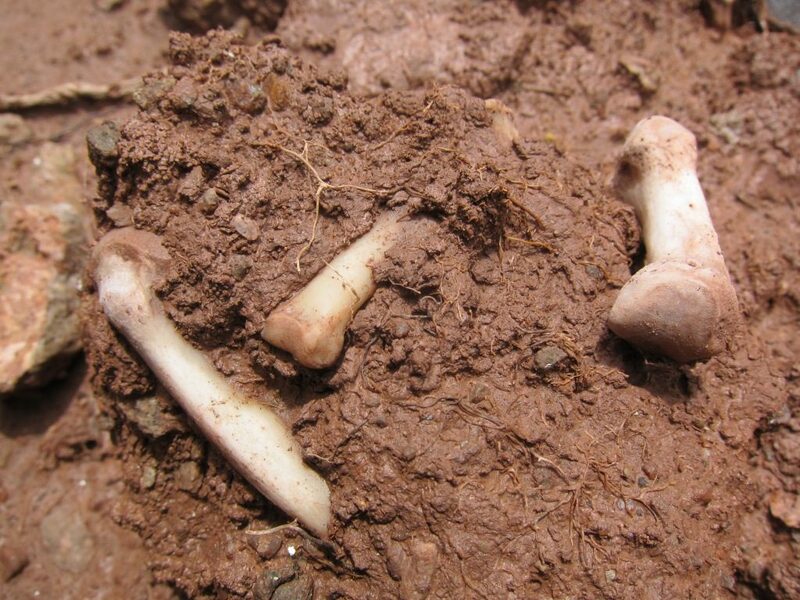 Human bones began emerging from below the soil. Lots of them, it was said. The past had come calling in the form of a mass grave. And the past was unconcerned about embarrassing the Chinese Government. 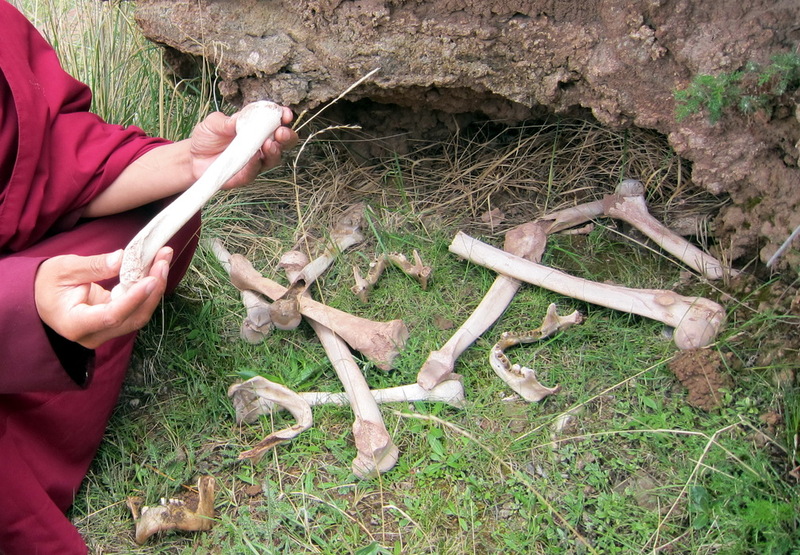 The images are clear, the local explanations were whispered: it was where monks and laypeople had been massacred in 1958, a bloody, terrible year in Eastern Tibet. 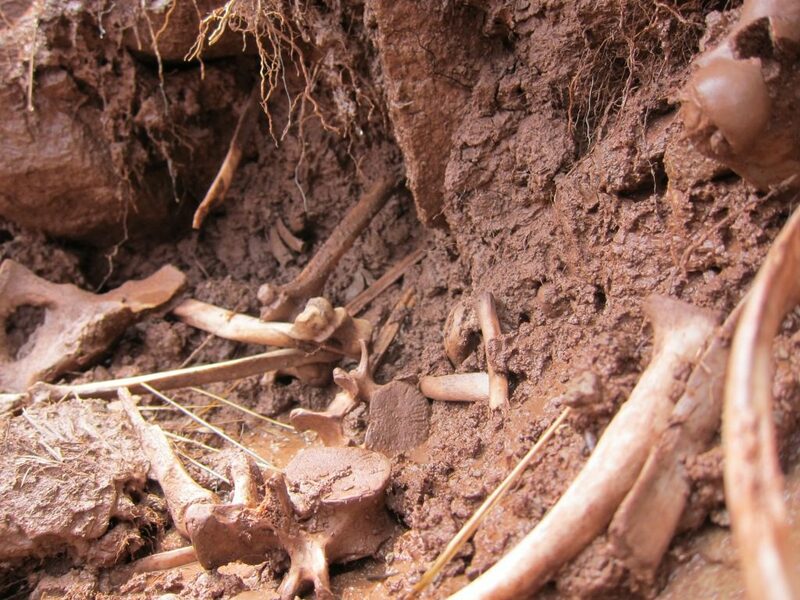 Elsewhere in Yushu, in the grasslands near Dpal-thang, the commencement of another construction project for houses brought more of the same: three mass burial pits filled with human remains. But not everything had decomposed, it was said. There were remnants of the clothes that the victims were wearing when they were thrown in: both lay clothing and monastic robes. The long hair of some of the dead was also still there. According to elders these pits were from 1958 too, with bodies added as a result of later famine deaths around 1960. Several trucks were needed to take the remains away. The 20th century has left no dearth of mass graves: Babi Yar, Katyn, Srebrenica: the list is long. And it seems that for almost 70 years the unearthing of one more mass interment site has elicited still more reflections on brutality, guilt, human frailty, hatred, totalitarianism, etc. But even as it is argued that the history of the bloody 20th century must be honestly recorded and taught to future generations in hopes that an awareness of what happened will lessen the possibility of it reoccurring, there is manifestly an unspoken understanding in some rather wide circles that China ought not to be harassed by its past—especially its past in Tibet. And the fact that this is harmful, not least to people in China who are expected, one supposes, to be defended against the pernicious effects of liberal thought, seems to elicit little concern. Indeed, the polite thing seems to be to leave them undisturbed within a political culture that, quite apart from everything else it does, mandates the veneration of one of the 20th century’s major mass murderers. Given such attitudes, it’s not surprising to find dissembling reactions—denial—to assertions of mass slaughter in Tibet. In place of intense criticism or condemnation of the Chinese authorities, who have for decades refused to open up records relating to what took place in Tibet, (let alone criticism of those whom the records would likely implicate in the savagery) there is a sort of indulgence that one might call the Chinese dispensation: the actions of China are to be seen as something akin to natural phenomena for which little or no moral judgment or critique is imaginable. It is the other actors who should be judged. 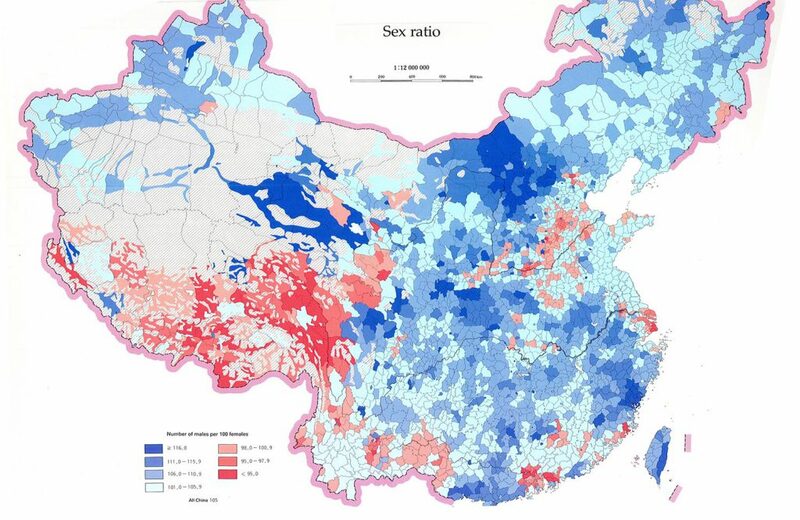 This can involve the selective use of available (and problematic) Chinese statistics as well as the ascription of much, if not most, of the population loss in Tibet to migration and exile. And there is also the common, droning refrain that accounts from Tibetan exiles are exaggerated and can’t be trusted. Instead of seeking to work through exaggerations to find underlying truths, this rhetorical device is deployed to dismiss, tout court, testimony from those who have fled Tibet. Hence this sentence (from the pen of Barry Sautman): “The [1.2 million] figure is not based on eyewitness accounts or access to state statistics, and refugee reports have often been skewed to please exile authorities.” Well, at least it implies the existence of Chinese records on the subject. Still, if passed over too quickly a reader might not fully take in that the criticism contained in it is directed not at China for preventing access to those records but at Tibetans for not using them: records to which neither they nor any serious researchers are allowed access! And then there’s the schizophrenia of: a) removing from consideration any accounts (including those by eyewitnesses) reported in exile because they are ‘skewed’ and then, having done so; b) saying Tibetans don’t have “eyewitness” accounts… Of course, the utter unreliability of the 1.2 million figure is not an issue of real contention among serious observers: Human Rights Watch already in 1988 termed it unverifiable. But this is not the same as dismissing (as Sautman does) the fact of mass killings in Tibet in the first decades of rule by the PRC. It is drawn from an article describing the traditional economic structures and conditions that prevailed at Lab-dgon monastery in Yushu. 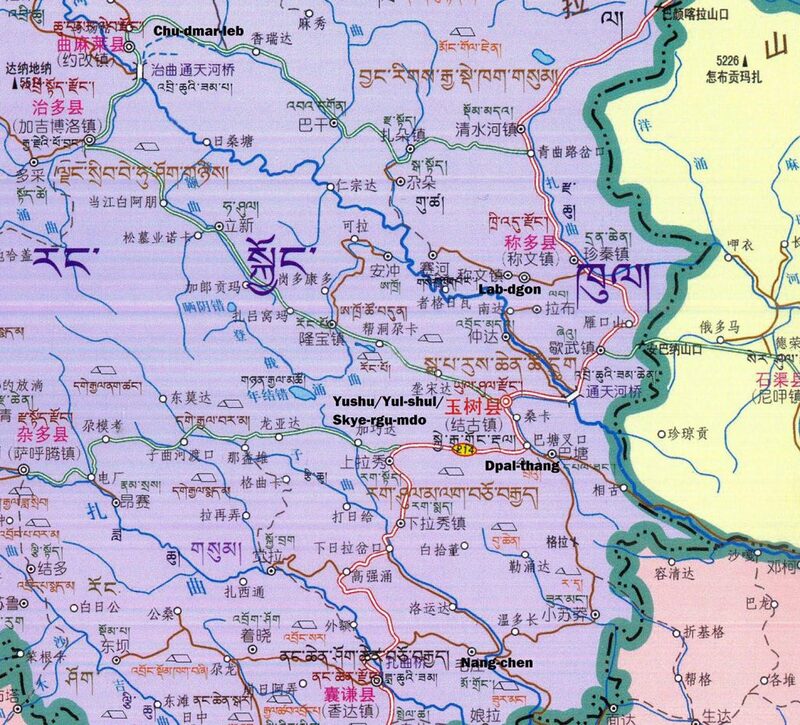 (The map below indicates the location of Lab-dgon in relation to Chu-dmar-leb and Yushu town [or Skye-rgu-mdo], the administrative center of the prefecture.) 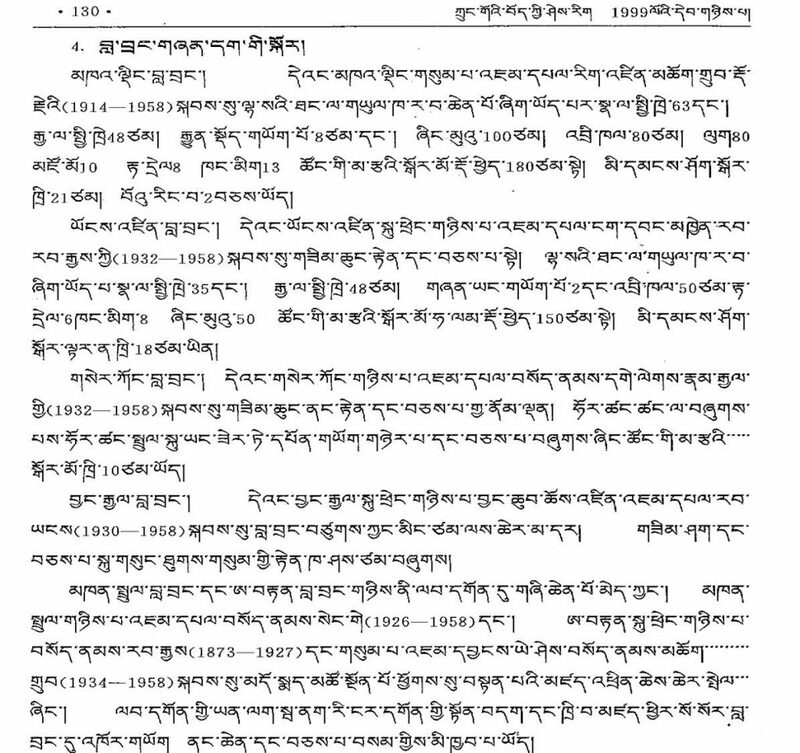 It provides information on the various bla-brang or residence establishments within the monastery and after discussing some of the major ones describes the others, mentioning prominent monks associated with them. It is likely that neither the author nor those who vetted and edited the article realized what this rather dry account shows. Indeed, most readers will likely read through the information without much reflection. But if one pauses and lets one’s eyes pass over the page (and for this a reading knowledge of Tibetan is not needed) one begins to see the past bleeding onto the paper: every one of the monastic leaders mentioned here who was alive in 1958 died in that year, just like those whose corpses littered parts of the landscape through which Nag-tshang Nu-blo travelled. It is at this point that denial of the reality of mass killings in Tibet has to be seen for the malevolent thing that it is. Like many of the denials of other mass killings it is not simply a result of someone’s detached dissent over statistical methodology. It is ultimately rooted in a political agenda. Yes, there is no public access to relevant Chinese records; yes, refugee accounts can be exaggerated; yes, the figures coming out of Dharamsala have no reliable statistical basis: all of this is true. But the fact that there is a gory and horrible truth behind the accounts that we do have is clear. The People’s Republic of China—for decades a highly bureaucratized state, after all—cannot but harbor in its myriad archives the data that would allow people to know once and for all the contours of mass death in Tibet in the 1950s and 1960s. That access to such records is denied to the outside world by that state speaks eloquently about what may be learned from their contents. That some would focus disproportionately on the clumsy Tibetan attempts at gauging the statistical extent of the tragedy, rather than on the adamant refusal of the Chinese authorities to open their records and archives to outside scrutiny; and that they would see the Tibetan effort as the malignant obstacle to answering the question of how many perished, speaks eloquently of their own rank biases. In the end, it is the records held by China that need to see the light of day. It is not enough to know, whether from direct personal accounts or indirect references in other sources, that something horrid and brutal took place in Tibet. It is necessary, surely, to make every attempt to know how many perished in the course of that brutality. But let’s go back to the comments I cited at the outset: it is equally necessary to make every attempt to see that as many of those who perished are known as people, not as mere statistics. To do otherwise would indeed be to allow mass murderers to shape our humanity. We may rightly wonder, when the records are finally opened, where we should place ’Jam-dbyangs ye-shes bsod-nams mchog-grub. He was the third A-brtan incarnation in Lab-dgon and his name is clear on the page from Krung-go’i Bod-kyi shes-rig. During his lifetime he did much to propagate the dharma in Amdo, we are told; he, like his predecessor, served and taught at one of Lab-dgon’s branch monasteries, gathering a considerable following. And then, at the age of 24, in the year 1958, there was nothing more.